Although I didn’t know Pat Maclagan well it was inevitable that we were acquainted with each other since our two clubs were fairly close together geographically and we were running in many of the same events. He was always very pleasant and I remember a conversation with him on the train into Glasgow. There were two races held in Glasgow at the start of the year – the Nigel Barge which had been on the first Saturday of the year since its inception and the Springburn Cup which had had many incarnations. In the year in question, Springburn decided to hold their race on the same date as the Barge but with bigger prizes and more of them. A fair few runners were talking of reneging on the Maryhill race but when I asked Pat which he was going to run in, he replied immediately that he would run in the Nigel Barge race – “after all, it’s a classic race, isn’t it?” That was exactly right and if you look at the racing programme described in Colin Youngson’s story of Pat’s career you will see that he ran in all the classic races in the country whether on the road, over the country or on the track. The SAAA Championships, all the cross country championships, the Edinburgh to Glasgow and others all appear in his story. Incidentally in the race in question, the winner was Ronnie McDonald from Monkland Harriers who was sub-4 miler from Pat in second place with the difference being only three seconds. Pat in turn was a mere one second ahead of the extremely talented Alistair Blamire who was two seconds up on Andy McKean, who was two seconds up on Alex Wight with Dave McMeekin 29 seconds back! Six men within 37 seconds and only eight seconds covering the first five! What follows is his friend Colin’s account of Pat’s career..
Patrick Maclagan, who was educated at Glasgow Academy, used to live in the quadrangle of Glasgow University, where his father was Professor of Moral Philosophy. Victoria Park AAC clubmate Hugh Barrow (who once held the world junior record for the mile) remembers doing interval sessions round the famous Gilmorehill Campus with Pat, under cover of darkness. Young Patrick had a good sporting pedigree, being related to William Maclagan who captained the first British Isles rugby tour to South Africa in 1890-91. 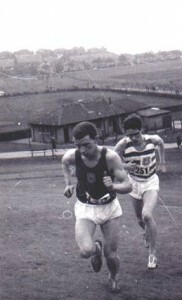 Pat was only nineteen when he ran the last stage in the 1963 Edinburgh to Glasgow Relay for Victoria Park. This event was of massive annual importance for his club, probably because of traditions created during the Ian Binnie era in the 1950’s when no fewer than seven E to G’s were won by the club. Ronnie Kane who ran in some of these winning teams, became club captain and coach, although Pat and other younger athletes of that era, such as Hugh Barrow, were coached initially by Johnnie Stirling who like Ronnie had won four E-G golds. The only race taken more seriously by aspiring fast men was the TRIAL for the McAndrew Road Relay, since the top eight usually ended up in the prestigious VP team for the E-G! In the autumn and early winter, every Tuesday and Thursday there were competitive pack training sessions over a variety of five or six mile routes round the local pavements. In addition the club organised three or four mile road races for the Crawford or Knightswood Shields. Compared to most of his clubmates, Pat was unusual in that he was also a good cross country runner, rather than mainly a road runner. By 1964 Pat was speedy enough to be only 8 seconds slower than the fastest time on Stage Three of the E-G and VP finished fifth. Next year they were up to third place with Pat only one second from fastest on Stage Three (and inside the previous record) taking VP from third to first. 1966 produced a silver medal for the club with Pat running the long sixth leg. Between 1963 and 1977, Pat ran Stages 2, 3, 4, 6 and 8. He did not run in 1970, 1974 or 1976; and represented Strathclyde University in 1973 and 1975, before returning to the VP team for the final time. His main club won silver in 1966 and 1971 and bronze in 1965. Pat was considered to be a good man to rely on and consequently was usually given the responsibility of running one of the two most important important stages – two or six. A good result in his cross-country career was in 1964 when he was twentieth in the Junior National cross-country championship and the VP team won silver. In 1965 he was up to seventeenth and team bronze. In 1966, VP finished second team in the Senior National with Pat second counter in twenty third – a very good debut. Later that season he finished an excellent thirty third in the English Senior National. Apart from that his best cross-country performances came in 1967 and 1968. First of all, Pat achieved a meritorious fourteenth in the Senior National (with VP third team), only just behind a well-known duo – Jim Alder and Alex Brown. This was actually the equivalent of sixth since there were eight New Zealand internationals in front of him including ex-Scot Mike Ryan. Deservedly Pat was chosen to compete in the ICCU Championships in Barry, Wales. Pat ran very well to be fifth team counter in fifty first place (beating Alex Brown, Alistair Blamire and Jim Brennan, with Ian McCafferty dropping out) and Scotland finished a solid fifth from ten nations. Pat also finished forty first in the English National that year. One of Pat Maclagan’s finest victories was in 1968 when he won the Midland CC Championships after a real battle over a hilly course at Bellahouston Park, Glasgow, surging away from fellow internationalist Jim Brennan before the finish. Thereafter Pat went on to finish eleventh in the 1968 National. He was also in the top twenty in the National CC in 1970 and 1972. In the summer of 1969, Pat Maclagan was the first winner of the John Kerr Memorial 12 at Airdrie, and finished well clear of the field in the Strathallan 22 breaking the record previously held by John Linaker. Signs of things to come in the marathon! Another good result was in November 1969 when Pat escaped from Eddie Knox on the “back-breaking slope of Clevedon Road” to win the Glasgow University 5.25 Miles Road Race. Alastair Johnston recalls Pat’s “many victories in the Vicky Park Club CC Championships, held at Milngavie, which involved taking on numerous fences over muddy farmland followed by hilly undulations over Hilton Park Golf Course (to which the likes of Hugh Barrow, Albie Smith and I were slightly averse!) However the versatile Pat was in his element! On the track in 1965 Pat was third in the West District Three Miles (14:27.6) as well as running Six Miles in 30:26.7 in the Scottish Championships. In 1966 he was again third in the West District Three Miles (14:16.4) and improved this time to 14:14.6 in the East v West match shortly afterwards. He then finished second to Don Macgregor in the Scottish Six Miles in 29:41. In 1967 he was fourth in the Scottish Six Miles (behind Lachie Stewart, Mel Edwards and Alex Brown) in 28:58, his best for that distance. In 1968 his focus was on road running, preparatory to eventually moving up to the marathon, but he did run 29:16.5 in the Victoria Park club championship Six Miles. In 1969 he was third again in the West 5000m and his season’s best was 14:42, plus 31:06 for 10,000m. 1970 saw him run faster: 14:33.6 and 30:26.2 respectively. In 1971, on 11th August, he produced a lasting personal best time of 30:04.8 for 10000m. Ten days later came another of his very best races: a one-hour event at Meadowbank. This was won by Jim Alder in a Scottish Native Record of 12 miles 618 yards with Pat an excellent second with 12 miles 400 yards (the best-ever by a Home Scot and tenth on the UK All-Time list) having gone through Ten Miles in 48:45. Almost a lap behind Pat were Aberdeen AAC’s Donald Ritchie, Alastair Wood and Steve Taylor. In the seasons after this Pat trained with less intensity and his track times became slower. It is interesting to compare his track times in 1970 and 1971 with his marathon times in these two peak years. Pat Maclagan was not alone in finding that proper marathon training can help your track times and vice versa! The Shettleston Marathon on 11th April 1970 was a marvellous debut for Pat since he won the race in a fine 2:22:03. In the high quality SAAA Championships and Commonwealth Games Trial Marathon in Edinburgh on 16th May he improved to 2:20:49 for seventh place, one behind his Victoria Park friend and rival Alastair Johnston (2:19:31). Alastair would undoubtedly have become an excellent marathon runner. Sadly this was not possible after a dreadful accident on June 16th 1972 when English Hammer Thrower Barry Williams to blame when his hammer bounced on to the Meadowbank track and shattered Alastair’s left tibia preventing him from winning a bronze medal in the SAAA metres championship. Poor Alastair was in plaster for 15 weeks and never really recovered top form although his contemporaries all knew just how good he could have become. Shortly after that, on 26th June 1971, Pat Maclagan easily won the Scottish Marathon Championship from Meadowbank Stadium, Edinburgh. His time was 2:21:18. Pat was working at the time as a production planner at J & P Coats Ltd in Paisley. He felt that he had ‘pushed his luck’ in doing three marathons in 1970. A stress fracture during the following winter gave him an enforced but invaluable rest! By April 1971, however, he was fit enough to run 48:15 for second place to Andy McKean in the lightning-fast Tom Scott 10-miler. Training amounted to 100 – 120 miles per week at this time, and was still at 90 in the three weeks before the Scottish Marathon. Most of this heavy work was fartlek work done in the forests around Aberfoyle. There was torrential rain at Meadowbank which forced officials to halt the track championships (temporarily) while the road runners squelched on dourly. After six days of training totalling 58 miles, Pat remembers starting the race by running through standing water. His Onitsuka Tiger running shoes had added foam padding under the tongue and heel pads. Since he did not wear socks, he had also taped the soles of his feet. Unfortunately the soaking dislodged a piece of tape to his considerable discomfort. Pat recalls complaining about this to Donald Macgregor, who replied callously or helpfully, “Why don’t you stop and take your shoe off, then?” Instead Pat spent some time trying to manoeuvre the offending tape between his toes so that it no longer became a problem. Bill Stoddart, the 1969 champion, thinks that no one was too keen to take the pace, due to the depressing conditions, so he led for most of 22 miles. By then Donalds, Ritchie and Macgregor, had dropped back and Willie Day had come through. According to Pat, Bill and Willie tried to get away at this point but he hauled them back. Bill remembers “Pat speeding past me as if I was going backwards, and he didn’t even say hello.” Or indeed goodbye! Pat Maclagan won the Scottish title by over two minutes, with Bill Stoddart second in 2:23:31 and Willie Day third in 2:26:07 – good times considering the weather. Pat remembers being confident of winning because “in general, the longer I ran, the better I was relative to most others.” In fact he covered the last lap in 70 seconds! In November 1971, once again Pat won the Glasgow University Road Race by one second from Alastair Johnston with new team-mate Colin Youngson fifth. A couple of months earlier, just before starting my teaching career, I had moved into Patrick’s flat. My diary records, “Life with monastic, dedicated Patrick, as well as two other flat-mates, was rather novel. Gradually I acquired Vicky Park’s superiority complex on the road; and its inferiority complex whenever a square foot of muddy grass loomed over the horizon.” Training with Pat certainly helped me to improve and, generously, he put up with me for a year, before I moved into another flat just off Byres Road with Dave Logue, the charismatic Northern Ireland steeplechase and cross-country international and cross-country runner. In January 1972 Pat Maclagan was selected for a small Scottish cross-country team to compete in the Chartres International event. Scotland won the team contest defeating France and West Germany. Pat was seventh, Andy McKean fourth and the great Ian Stewart the individual victor. After that, Pat began to concentrate more and more on his studies at Strathclyde University and he graduated with first-class honours. Before long he went to Hull to work as a lecturer, and to publish one book and many articles, some of which are available online. Although he is now retired, as an Emeritus Fellow at the Business School, University of Hull, as of 2010 he was still writing the occasional academic paper and going for one or two forty minute runs a week over the country plus a lot of brisk, one-hour walks. After his move south, he competed for some years for City of Hull AC and in one of his last races finished fourteenth in the 1983 Ferriby 10 in 51:11. In Scotland, he should be remembered as a dedicated, determined, consistent and versatile athlete who achieved a great deal. Having re-read the piece, there is one thing that is missing I think. Many athletes with Pat’s talents and list of achievements would have shown it in some way in their dealings with others: phrases like ‘doesn’t suffer fools gladly’ and the like are bandied about as an apology/explanation. There are athletes who change in their dealings with others when success comes. Pat was none of these. He was modest in the best possible way – as I said, I didn’t know him as a person but he was always friendly and didn’t seem to change as the successes grew. Finally, I always find it interesting to see athletes running in the same event over several years as a kind of rough measure of their progress. On long road races the times are often affected by the weather – eg the Clydebank to Helensburgh was run into the prevailing wind and then one year the wind was behind the runners and almost picked them up at Clydebank and threw them to Helensburgh. The result was a whole series of personal best performances and a course record that stood for some time! Bearing that in mind, we can look at Pat’s competitive record in two races in particular. The first is the 14.5 mile race at the now unfortunately defunct Dunblane Highland Games. The Dunblane race was one of the most scenic in the country: leaving the park it crossed a field to a road out of old Dunblane and on to the A9, the main road North, as far as the turn off for Braco and Greenloaning when it turned onto the back road twisting and winding its way through Kinbuck on its way back to the arena. The drag up the A9 was a pretty serious slog until the turn off. 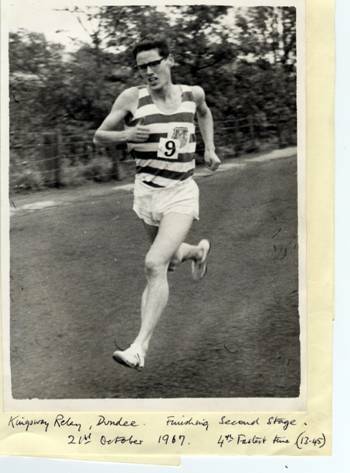 Following up what was said in the first paragraph about running in all the classic road races – many if not most of which are no more – Pat ran in the Drymen to Scotstoun race on 24th May 1969. This race with its fierce climb up the Stockiemuir Road from Drymen had one of the longest and most unremitting climbs in the country had been the subject of many good races featuring many of the Scottish ‘greats’ such as Dunky Wright, McNab Robertson and Emmet Farrell. The result this times was: first, AJ Wood in 1:17:53, second P Maclagan in 1:18:59. What do we get from the above statistics? First and foremost we see that Pat was a top class racer and not just a time-trialist. The Shotts race in 1968 fully demonstrates that – every one of the first five was a Scottish Champion, three of them (Stewart, Linaker and Wood on track as well as country and Wood of course a multi marathon champion) and all were ferocious competitors. Second he could compete in fast races – which was just as well because he was running and racing at a time when the standard of road running in Scotland was probably at its highest ever. Some competitor, Pat!